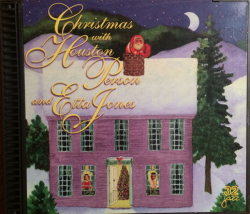 With Etta Jones' blues-inflected vocals and the sensuous and the sax of Houston Person, this CD turns out to be one of the more attractive Jazz Christmas albums. Jones and the trio of Horace Ott, Wilbur Bascomb, and Cecil Brooks III take on White Christmas and Merry Christmas Baby. Peter Martin Weiss' bass and Stan Hope's piano are featured on God Rest Ye Merry Gentlemen.